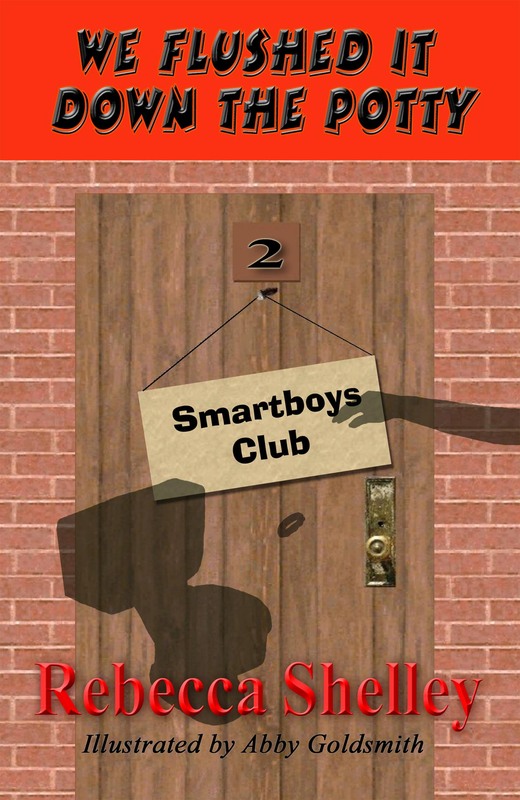 In the second Smartboys Club book, the Smartboys face off with a bully that flushes Vinny’s heirloom ring down the toilet, but Monkey’s creative solution to stop the bully lands him in big trouble. Hi, my name’s Monkey. Okay, it’s really Johnny Lovebird, but don’t tell anyone. I hate that name. Everyone at school teases me about it except for my best friends, the members of the Smartboys Club. That’s Bean and I, Vinny and Art. Okay, so Vinny isn’t a boy but she’s twice as smart as Bean and I. And Art isn’t good at math and language arts, but he can make a basket every time he shoots the ball. Plus, he draws dinosaurs better than anyone. There are different kinds of smarts you know. All of us together are way too smart for fourth-graders, and sometimes we have to use our brainy brains to stop all kinds of trouble. Like last week when a bunch of crazed ninjas tried to take over the school. This week we had an even bigger problem. It started at the end of recess. Bean and I were out in the hall, arguing over the best way to measure the height of the clock tower at the train station. I said we should count up the number of tan bricks between each of the black ones, then count the number of black bricks and times by the number of tan ones. Before Bean could say his idea, we heard the toilet flush in the bathroom and Vinny scream. Bridget, one of the other fourth-graders in Mrs. Red’s class marched out of the bathroom with a fat grin on her face. Vinny came close behind, her cheeks red and her hands balled into fists. She eyed the back of Bridget’s head like she wanted to grab her long blond hair and yank it out by the roots. Mrs. Red opened the classroom door to let us in. Apparently she hadn’t heard Vinny scream, because she smiled at Bridget and handed her a stack of papers to pass out. Mrs. Red likes Bridget best. My heart did a flip-flop. Vinny had missed school to go to her grandmother’s funeral. The ring was her grandmother’s wedding ring, the only memento Vinny had to remember her by. Vinny’s grandfather had been a jeweler and made the ring himself. It was a one-of-a-kind family heirloom. “Shoot. We’ve got to get it back,” Bean said. He’d come up on the other side of Vinny’s desk. Screech. Mrs. Red wrote our names up on the white board for being out of our seats. I tell you, she might as well just leave our names up there all the time. I flopped into my desk and drummed my fingers on the wooden top. In my mind I pictured Vinny’s ring spinning away in a swirl of yellow water. Bean’s hand twitched next to his pocket where he kept his cell phone. I could tell he wanted to get it out and start searching the web for whatever plumbing information we might need. Mrs. Red glared at us. Her hand hovered next to our names, waiting to put a check mark by them. Bridget set the paper on my desk with a sneer. The pink sheet was our math test. The class just learned to times double digits. I rolled my eyes. Bean whipped out his pencil and waited, muscles tensed for Mrs. Red to say start. Usually we pretend we’re no smarter than the others in the class. Not today. Moments after she said go, Bean scratched the last answer on his page. He handed it in, then got out his language arts book. Pretending to read, he opened his cell phone behind the book, got a signal, and connected up online. “What’s going on?” Art mouthed to me. On the back of my paper, I drew of picture of Vinny’s ring going down the toilet. Pictures are the best way to tell Art stuff. When Mrs. Red’s back was turned I lifted it for him to see. Then I pointed to Bridget. Art’s face went red. His dark eyes got the look reserved for fifth-graders who think they can beat him at basketball. “Johnny, put that paper down!” Mrs. Red’s back was still turned. She must have heard me lift my paper. She put a check mark by my name so hard the tip of her marker pressed flat. A check mark means you have to go out in the hall for think-time. I got up and headed for the door. I grabbed the icky pink test and marched out. I used to flunk tests just for fun. Not since the ninja incident, and not today. I wasn’t in the mood. By the time my think-time ended, I’d timesed all the double digits perfectly, then on scratch paper, added them, subtracted them, divided them, and converted them to fractions. But my mind wasn’t thinking about math. I stared at the girl’s bathroom as if by sheer will I could levitate the ring back up out of the sewer. By the time the recess bell rang, Bean had his phone put away. His eyes sparked with determination. He motioned for Art to look after Vinny and told me to follow him. He stopped in front of the round, metal plate that marked where the water pipe led onto the school grounds. A frown wrinkled his forehead like an old man. “We gotta find the sewer line, excavate a part of it, insert a screen, and hydrojet the whole system. The force of the water will trap the ring up against the screen. The problem is we don’t have the equipment.” Bean kicked at the half-dead grass by the metal plate. Bean looked around as if he might find a shovel or, better yet, a backhoe lying around for us to use. A commotion over by the doors pulled my attention away from the sewer problem. A group of girls led by Bridget stood in a ring around Vinny and Art. Their shrill voices rose in a mean chant. Vinny, Vinny, way too skinny. Thinks she’s smart, but she’s a ninny. We flushed her dumb ring down the potty. I left Bean to the sewer problem and ran across the grass toward the group. My heart pounded and my face burned. Nobody messes with the Smartboys. I skidded to a stop nose-to-nose with Bridget. “Knock it off,” I said. I cringed, knowing what came next. “Shut up!” I yelled, grabbing Bridget’s arm. That’s when Mrs. Red grabbed me. “What’s going on here, Johnny?” she asked. “Bridget flushed Vinny’s ring down the toilet,” I said. “That’s not true,” Vinny said, but Mrs. Red didn’t hear it as she marched me to the principal’s office. “I caught Mr. Lovebird bullying a girl in the schoolyard,” Mrs. Red said, thrusting me into Principal Green’s office. 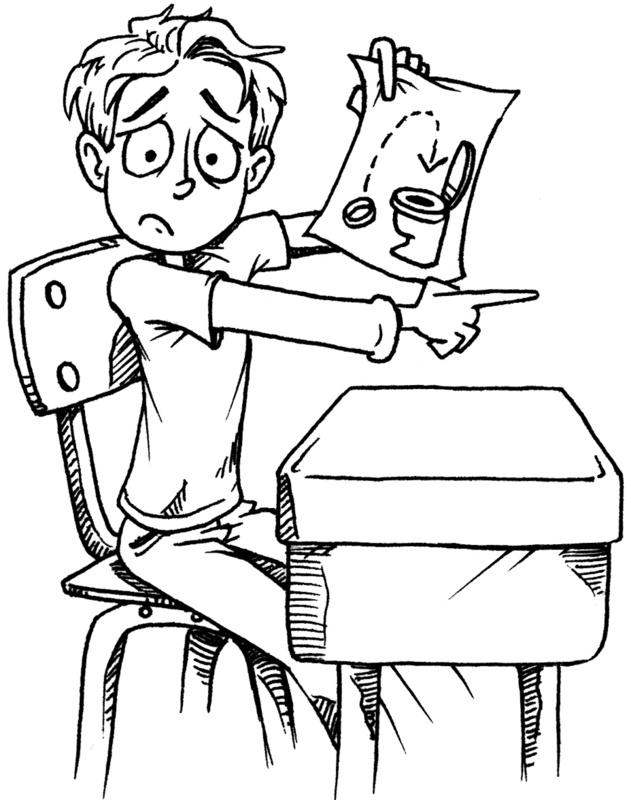 Principal Green motioned for me to take a seat in the hard wooden chair in front of her desk. Her eye twitched, and she jumped when Mrs. Red slammed the office door on her way out. Principal Green had been jittery like that ever since the ninja incident. “Bullying,” I said. “Only it isn’t me.” I explained about Bridget and her gang of meanies. Principal Green’s eye twitched the whole time. When I’d finished, she stood up. “Grabbing is not how we solve problems. Talking things out is the way to solve problems.” Principal Green leaned across the desk so close to me I could see where her thick makeup stopped and her real skin began. “Right, like you talked to those ninjas,” I said. It had taken all-out battle to free the school from the ninjas. If the Smartboys and I hadn’t fought, Chrom-El would have been a charter school permanently. “Yes, Ma’am.” I edged to the door. She was right. I shouldn’t have grabbed Bridget. What did I think I was going to do next, hit her? No way. It was time for me to start thinking like a Smartboy.